UTEP faculty, instructors, and course designers: Fill out and submit this online form to request bibliographic (library) instruction, services, and/or resources from the University Library for each course, including films from Swank Digital Campus. This form can be used to submit requests for new Library materials in batch (via an uploaded resource list or syllabus) or on an item-by-item basis. All requests will be acknowledged within 24-48 hours of form submission and will be assigned to relevant instruction, subject, and acquisitions librarians as well as Library support staff for follow-up and fulfillment. • Click on each section and fill out all relevant information as needed. • Do not close this window before finishing and submitting the form or all data will be lost. • For help with this form, contact the UTEP Library Serials & Electronic Resources Team or the UTEP Library Instruction Team. The University Library provides library and information literacy instruction sessions for students to better acquaint them with library resources and to demonstrate best practices for finding sources of information. These can be given face-to-face or online. You may also embed or include a librarian on a discussion board within your course shell in the role of teaching assistant or instructional designer to work with your students at their point of need. For more information about library instruction or embedded librarianship, contact Harvey Castellano, Associate Library Director for Instruction and Information Literacy Services. Would you like a library instruction session for your course? Would you like to have a librarian "embedded" in your course? Does the class meet in a computer lab? Please include any questions or requests you have for your Instruction Session. Disclaimer: All requests for new Library resources will be reviewed and prioritized according to the UTEP Library’s Collection Development Policies. New acquisitions are determined by the amount of funds allotted for each subject discipline within the scope of the Library's budget. Foreign publications and books older than five years should be requested by January 15th of each calendar year. Non-book resources such as journals, databases, and videos should be requested at least 6-12 weeks in advance of when they will be needed. Some of these formats, such as databases and journals, require more extensive review (in terms of the Library's budget); others, such as videos, require more lead-time to acquire, especially if they are not readily available from the Library’s standard providers. For streaming video requests, allow sufficient lead-time for the Library to source, negotiate, and license the digital streaming rights, if available. This process can take from six months to one year. Extra lead-time will be needed for re-formatting or for the addition of ADA-compliant accessibility enhancements such as transcripts or closed-captioning. Refer to the Library's Visual Materials Acquisition Policies for details. Publications in stock with the Library’s major book vendors can usually be ordered up until May 15th of each calendar year. For questions, contact Kathy Poorman, Assistant Library Director for Technical Services. Textbooks and other course materials should be ordered through the UTEP Bookstore. Course Packs may be ordered via the UTEP Print*Copy*Mail Solutions or the UTEP Bookstore (XanEdu). 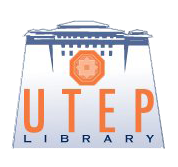 To request individual journal articles, books, book chapters, or other publications for educational, research, and/or personal use, use the UTEP Library’s Interlibrary Loan (ILL) Service. Do you want the Library to create a Research Guide for your course? If yes, when will it be needed by? UTEP Course Resource List Checking Service: This free, optional service is provided by the University Library whereby UTEP Course Resource Lists submitted by instructors or on-campus service providers (e.g. : UTEP course designers, UTEP Print/Copy/Mail Solutions, Campus Book Store) are checked against the Library’s holdings to determine which items, if any, are already available and ready for use in support of the course at no additional charge to either the students or the faculty. This service also helps to determine where each resource falls within the University of Texas System’s “Web of Rights” used to manage the risk of copyright infringement. The “Web of Rights” authority sources are as follows: 1) Library licenses negotiated for access to e-resources; 2) UT System’s Annual License with the Copyright Clearance Center (CCC); 3) Open-Access publishing and CreativeCommons licensed materials; 4) Fair use provision for certain educational uses under U.S. copyright law; and 5) Works in the public domain (e.g. : federal government documents). For commercial course packs, the University Library performs this service on behalf of UTEP Print/Copy/Mail Solutions (Ricoh-USA). Would you like a course resource list or syllabus checked against the Library's holdings? Would you like the Library to set up Course Reserves based on a resource list or syllabus? Will you be requesting a Course Pack from Print*Copy*Mail Solutions or the UTEP Book Store (XanEdu)? NOTE: Answering "Yes" to this question does not constitute an order for either of these services. You will still need to place your order directly with the appropriate entity. For more information on the UTEP Library's policies and procedures regarding Course Reserves, click here. Campus departments housed within the University Library building include the Math Resource Center (MaRCS), the University Writing Center (UWC), and the Assistive Technology Lab (ATL). These departments provide academic support and services to UTEP faculty, staff, and students, upon request. Will your students need assistance from the University Writing Center (UWC)? Will your students need assistance from the Math Resource Center (MaRCS)? Will your students need assistance from the Assistive Technology Lab (ATL)? Would you like a face-to-face consultation with a librarian?